Yesterday, shortly after we covered how the planned Kilmainham Civic Space scheme could fit dedicated space for cycling, Dublin City Council released impressive overall plans to give space over to walking, public transport and cycling. But the devil will be in the detail. Some of the concept photomontages are not impressive regarding space for cycling. The mistakes made in Kilmainham are echoed in key city centre locations such as College Green. If there is going to be such impacts on current car commuters modes we’re going to expect at least some of those people to transfer to cycling — so conditions must be safe and attractive. Mixing with buses on the city’s busiest bus routes should be out of the question. 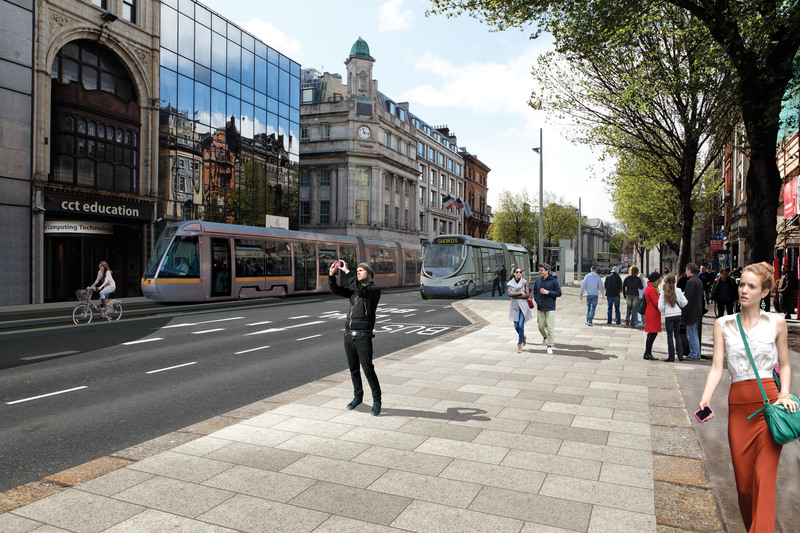 Outside the gates of Trinity College Dublin a close-up of the photomontage shows that Dame Street bound bicycle users will be mixed with buses in a new right hand turning lane between the Luas team tracks which are due to be installed. This is a million miles away from the modern designs used in cycling cities such as Amsterdam and Copenhagen. Why is Dublin still not taking the concept of ‘cycling for everybody’ seriously? Cycling already accounts for 30% of traffic at a nearby junction, this is already increasing and with the overall impressive city centre plan released yeasterday cycling is expected and likely will increase a lot more. The pictured designs are the kind which result in people on bicycles breaking red lights, cycling on footpaths and cycling on tram tracks where they should not do so. The turn itself is shown as empty in the image but here bicycle users will have a line of buses behind them and so they will be under pressure to cross the tram tracks quickly. After the turn, heading westbound on Dame Street, there’s nice new paving bus but people on bicycles are left to mix with buses. People who cycle on O’Connell Street will know that nice paving does not mean nice conditions for cycling. It’s a horrible street for cycling on. On Westmoreland Street we’re unsure if there’s a cycle path/lane between the roadway and tram tracks. We can’t make it out for sure. But we do know that the city needs to take cycling seriously and it has yet to fully do so. Where mistakes were made in Amsterdam, we’re told they lasted for 25 years before correcting them, when tram tracks are involved it might be more like 50 years in Dublin. Let’s get it right the first time. Very good points, it really looks like they don’t care about cyclists in this plan at all. Bang on Rachael. They never did and never will. Councils and the government are masters at the age old Irish art of Lip Service.